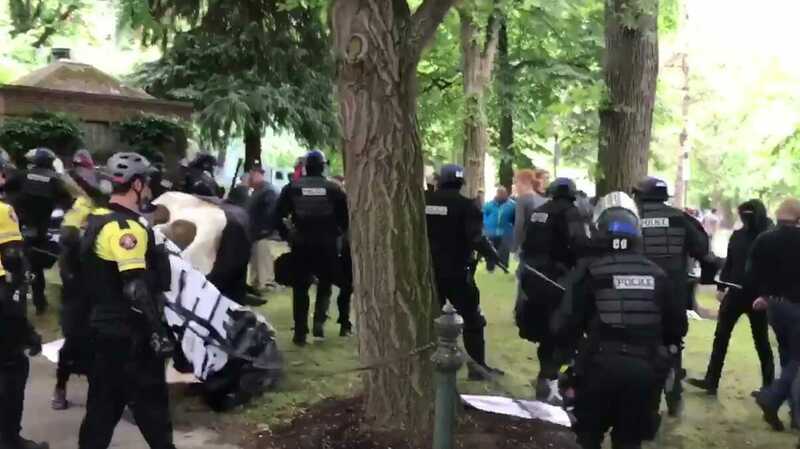 The dueling protests in Portland are off to an exciting start, as police rush into the anarchist crowd to start confiscating possible weapons and making arrests. In one park are the Trump supporters, and in another park and along the sidewalks are the counter protesters, made up of various anarchists, “antifa”, illegal alien supporters, and other communist sympathizers. As of 2:35 PM, police have confiscated an assortment of weapons, including dynamite, lacrosse sticks, and a giant skeleton middle finger. Stay tuned to Gateway Pundit as we provide updates throughout the day.